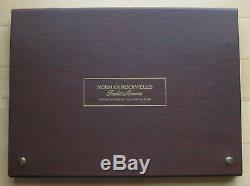 Product Description This listing is for the Norman Rockwell's Fondest Memories First Edition Proof Set (minted by the Franklin Mint in 1973) shown in the pictures. The set features 10 sterling silver bars that are each marked "1500 Grains Sterling" with the edge number "9429". The bars are not in pristine condition as you can see in the pictures; there are various scratches and fingerprint marks on some of the bars. The brown folio is in good condition, though there are nicks and scratches on the wood frame. There is no paperwork or COA included. Please use the pictures to determine quality and feel free to ask questions. Folio Dimensions (closed): 16.75" x 12.5" x 1.5" Bar dimensions (L x W): 2.5" x 2 Listed bar weight (ea): 1500 grains (3.125 troy ounces) Actual bar weight (ea, avg): 3.206 troy ounces Actual total bar weight: 32.06 troy ounces Bar composition. 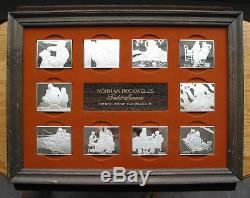 925 fine sterling silver List of Norman Rockwell scenes: At the Barber, The First Date, Playing Hookey, The Knitting Lesson Holiday Dinner, The Big Parade Day Off, The Checker Game, The Patient, Fun on the Hill. The item "Norman Rockwell's Fondest Memories 10 Sterling Silver Bar Set Franklin Mint" is in sale since Monday, June 25, 2018. This item is in the category "Coins & Paper Money\Coins\ US\Collections, Lots". The seller is "cobull707" and is located in Canandaigua, New York.